There are 24 major glaciers in Switzerland. We had seen the one on Mont Blanc in France before and it is truly magnificent to see, especially in the summer when everything else has melted. 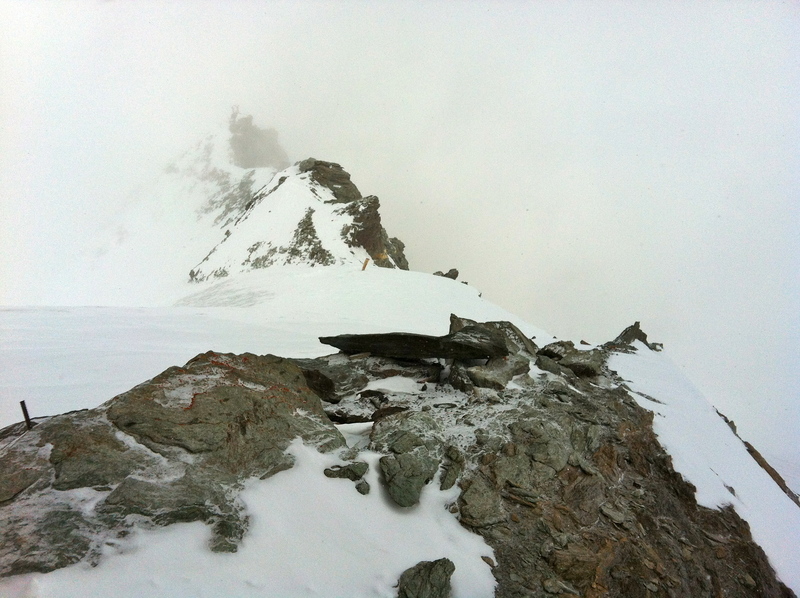 However, we had a closer experience during our time in Saas-Fee. As you can see from the photo below, the glacier is visible from the town. See the blue? That's the glacier! 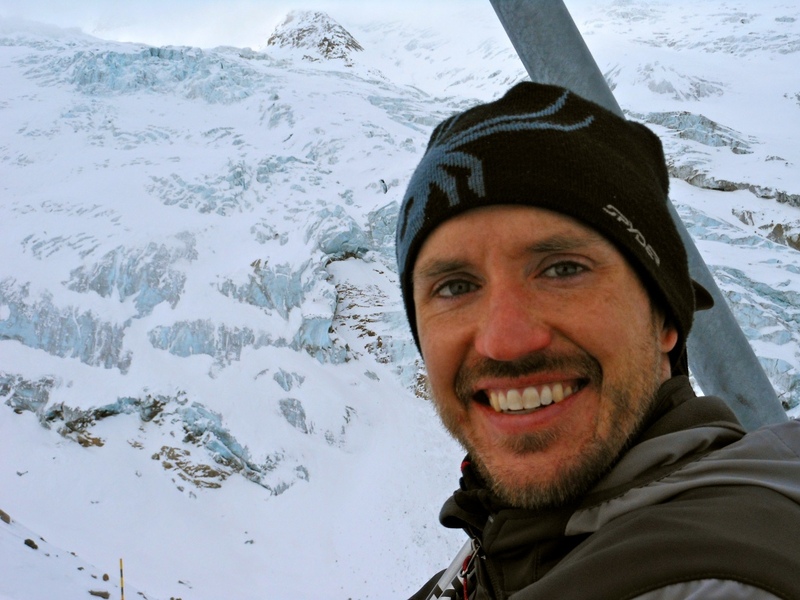 What is neat about Saas Fee is that you can actually take a cable car up to ski or hike on top of the glacier. Gabe and S & S skied on the glacial snow. 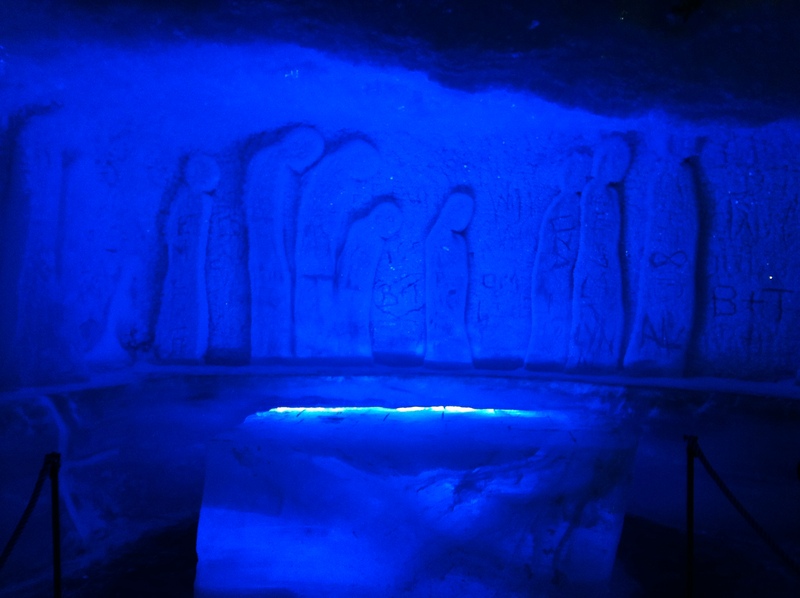 While they rocked out their glacier skiing, I decided to explore the Ice Grotto and revolving restaurant found at Mittelallin, 3,500 meters or 11,480 feet high, directly above Saas-Fee. Both are considered the world’s highest of their kind. Worlds' highest revolving restaurant - 2 miles high. 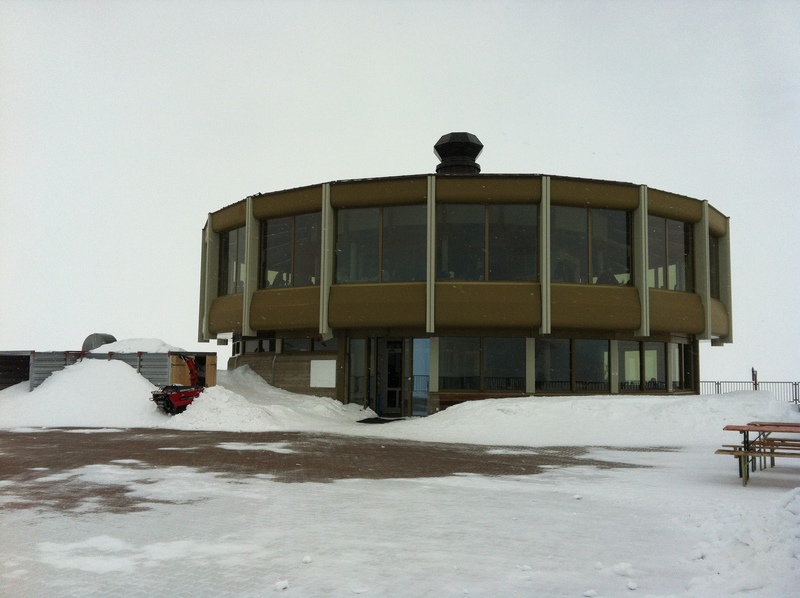 I’d like to point out that when its snowing, it doesn’t really matter if you are two miles high on the worlds highest revolving restaurant. 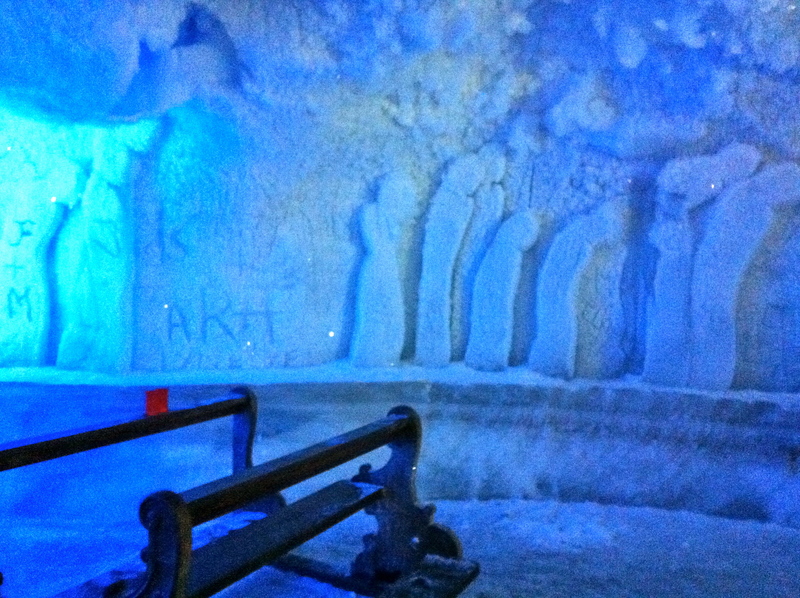 Also at the top of Mittelallin is the Ice Pavilion — a glacier that you can walk into. It was my first time stepping inside a glacier. 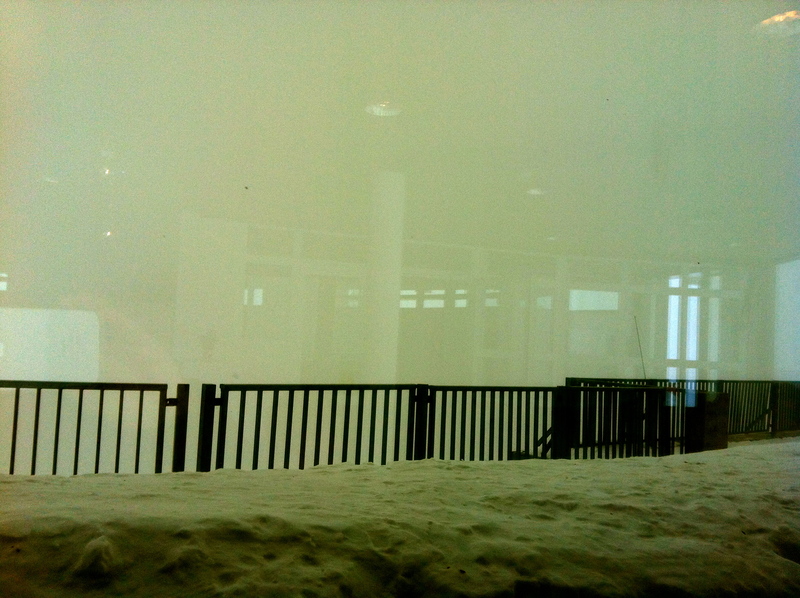 At -12 C outside air temperature, it was super frigid inside. 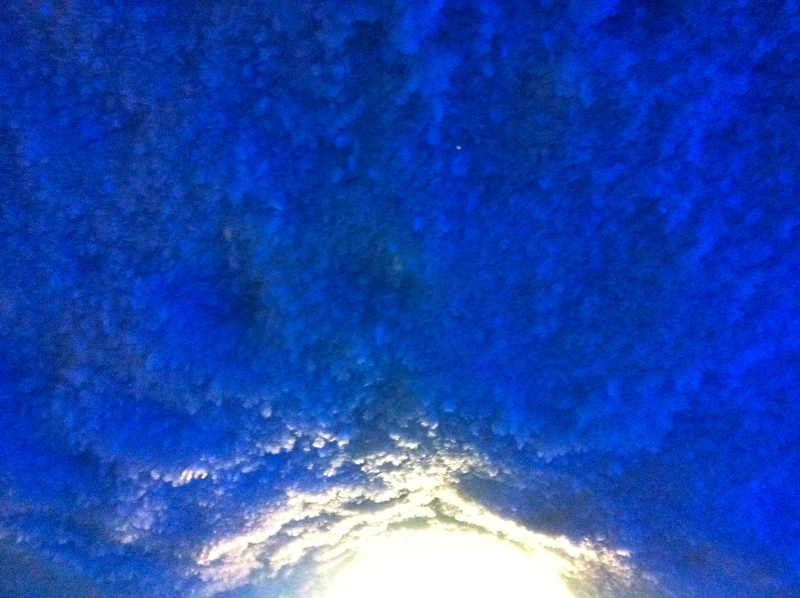 It was Sunday and quite a coincidence they had an ice chapel at 11000 feet. 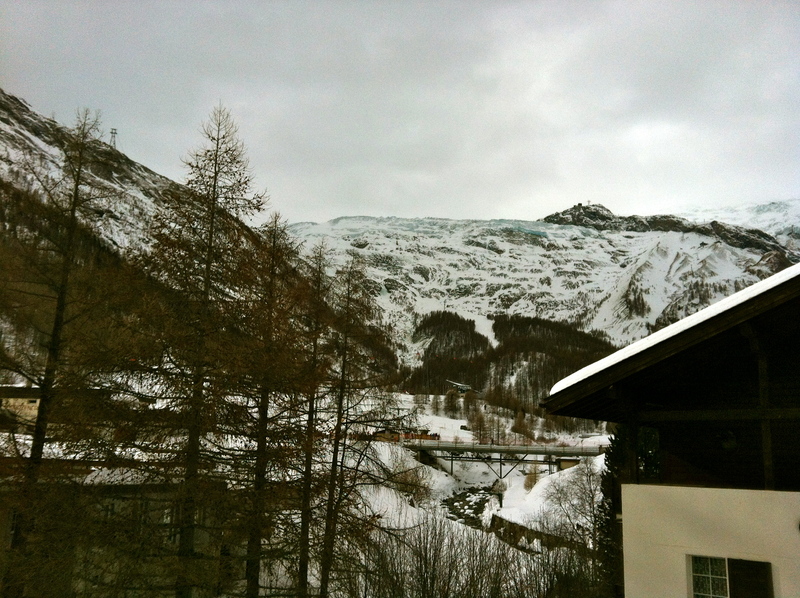 It was a nice relaxing way to spend a Sunday, sans skiing in Saas Fee. Say that 5 times fast. We decided that it would be good to spend my last weekend prior to surgery doing something wintery. We knew it would be quite awhile before I could experience the outdoors again. At least on foot. The week had been super busy planning for surgery and prepping meals to freeze, so I hadn’t gotten around to selecting a place or activity. So, we pretty much decided where to go at 9pm Friday night at Happy Hour at S & S’s place. We planned to hit the Carnival celebrations in Wiler and to continue onto Saas Fee in Valais to spend the night and potentially do winter sports Sunday. S booked hotel rooms round midnight for that next day. 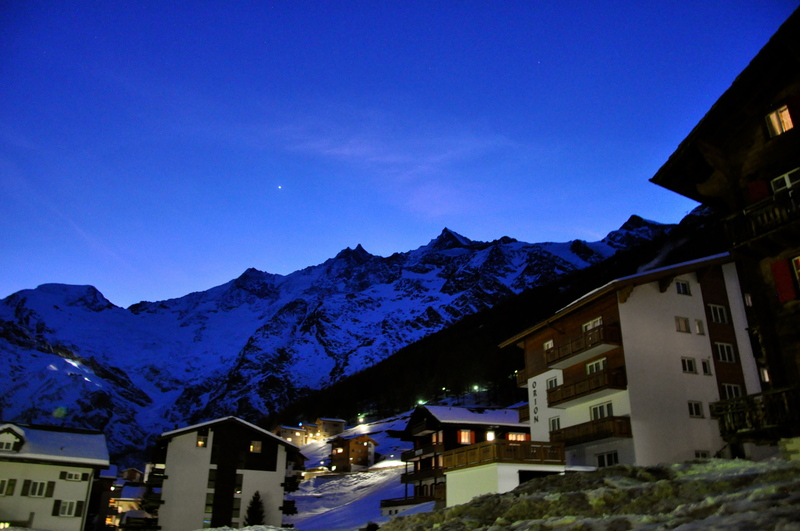 Saas Fee is located in a valley very close to Zermatt. Until the mid-twentieth century, it was remote and not accessible by cars. 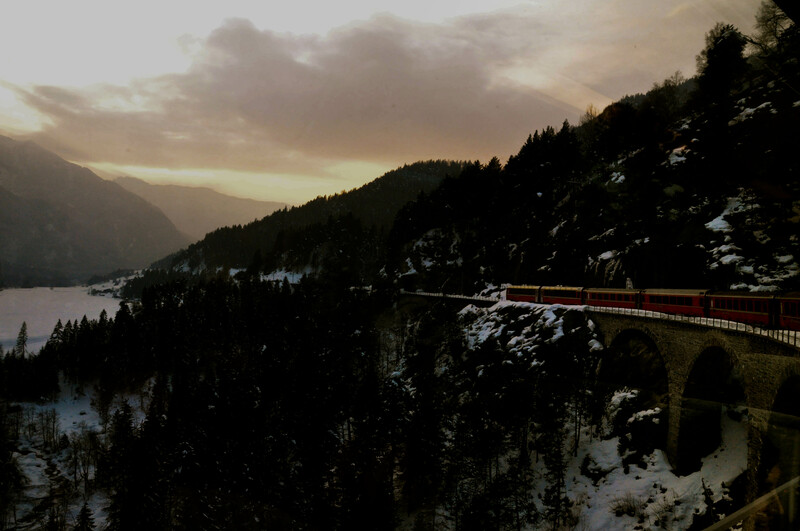 Currently, trains are still not able to reach Saas Fee through its narrow valley. However, even though you can drive there now; the village itself is car-free. You must leave your car at the deck at the city entrance. 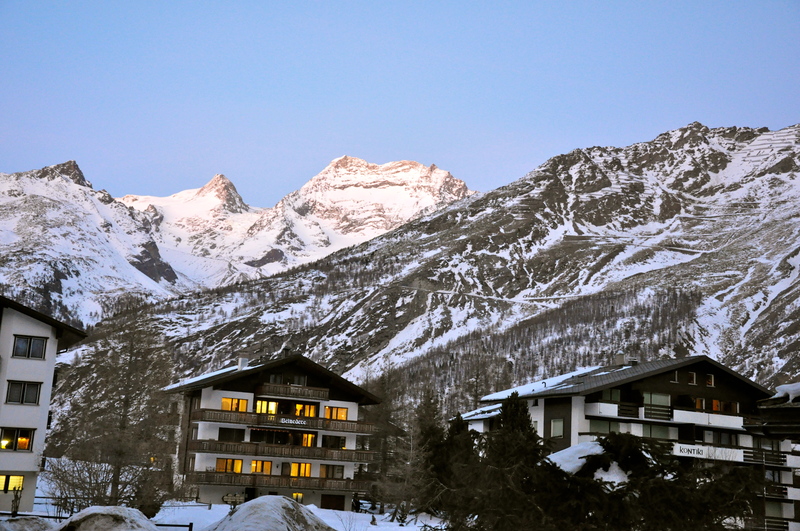 The books say that Saas Fee is just as picturesque as Zermatt, just without the Matternhorn view. For all Gabe and I know, it was equal since we didn’t see the Matterhorn when we went back in January with Pascal and Gisele. 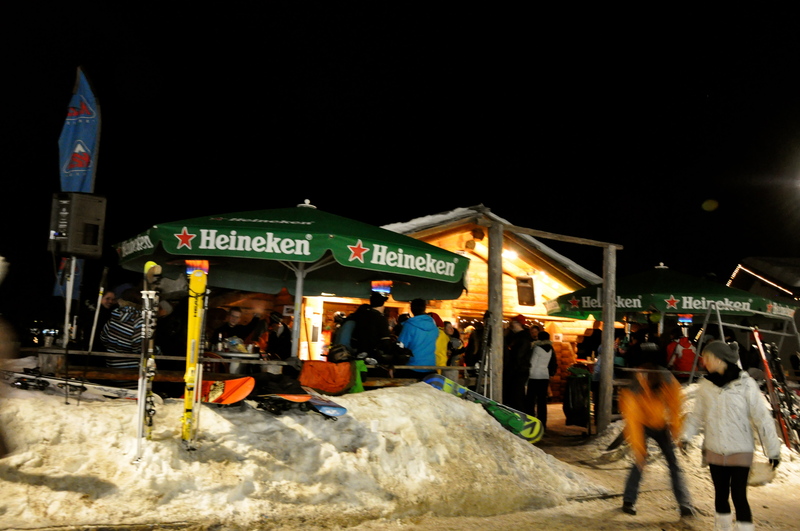 We arrived at sunset and it was quite nice to walk around and to see the après ski buzz. After exploring, we grabbed a bite of Italian at Boccalino and then had an after dinner drink at Popcorn. We called it an early night due to the ski activities planned for the next day. Saas Fee was a lovely little town. I think I might prefer Zermatt a little more, but all in all, a nice stop. In Switzerland, you don’t go to the hospital for planned procedures such as delivering a baby or foot surgeries. You go to a Clinique. No, not like the make-up counter. A Clinique is like a cross between a doctors office and a hospital. And then add in a little high end hotel. In Switzerland, they are very cautious. They don’t take chances. So, I wasn’t surprised when my doctor indicated that I would need to come in the night before to spend the night at the Clinique. Nor was I surprised when I found out I would stay four nights there. I had a bit of trouble trying to convince my US-based insurance of this. “Wait, Ma’am. Why do your feet hurt? We have noted you were having a colon operation”. “We don’t understand….why do you have to stay in the hospital so many days? In the US, we see in our computer that this is outpatient”. Later that day, I got my letter. Thank goodness. A dessert also came around at 2pm each day with coffee. The cream was always steamed and piping hot. Regarding forms and documentations, EVERYTHING, must be translated from French in order for me to understand and sign. All pre-op, insurance, and post-op instructions. Google Translate has really been a good friend of mine lately. I’ll no longer complain about having to fill out paperwork in my first language. Speaking of French, communication at the Clinique has been a bit challenging. Of course, I do not expect that the staff know English at all since this is a French-speaking country. And I do study French regularly. However, in medical situations: explaining levels of pain, what is wrong, and interpreting post op instructions clearly, it can be a bit challenging. The first time they were trying to teach me how to walk with my stabilizing boots and crutches to get to the bathroom, I couldn’t do it. We tried to communicate in my tres mal français where to put the weight so I could improve my technique. I kept misunderstanding, so it took a while to master. I have been improving because my roommate is a Swiss woman in her mid-seventies who is very chatty. She told me I can come visit her at her house when I can walk and we can talk French again. In summary, the medical care is FANTASTIC here. If you think you might undergo any type of procedure in Switzerland, just be prepared for battles with your insurance and a crash course in French translation. *All doctors offices and visits require upfront payment in Switzerland. You then have to file the claim and track your reimbursement with your insurance. Believe me, it’s a ton of fun. Don’t blame them though…a smart business practice. **Our friends had their baby in the same Clinique as me this same week (so nice to have visitors!). They were supposed to have a C-section on Monday, but BOTH their primary doctor and his back up were injured while skiing during Ski Week. They had to push their delivery up a day so that the 3rd doctor could fit it in, apparently the only one in the practice who wasn’t injured during Ski Week. And yes, they stayed 7 days in the Clinique as well with their newborn! 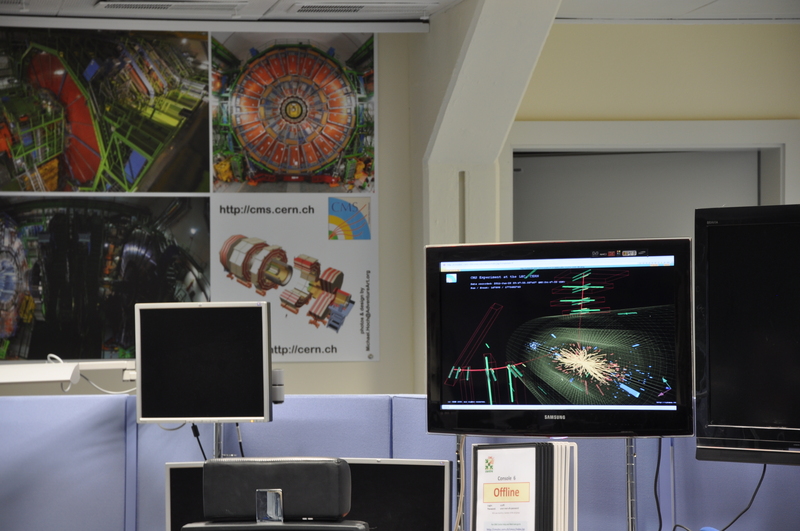 Recently, I was fortunate enough to get into a tour at CERN. 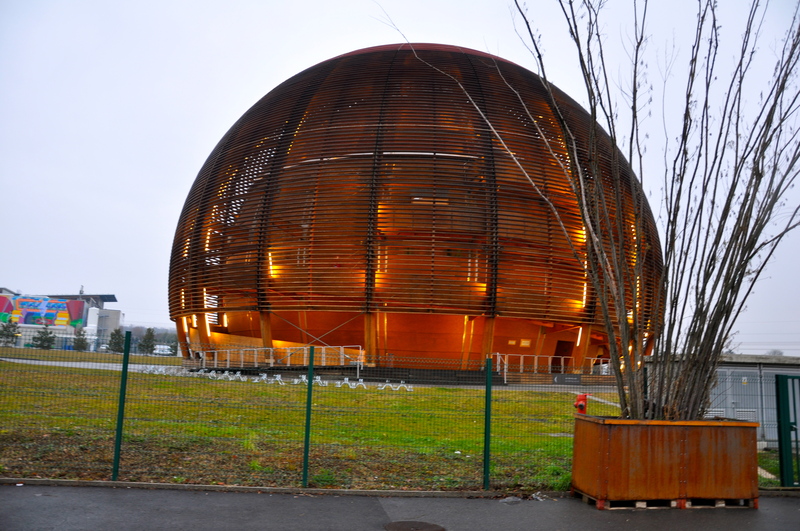 CERN is located in Geneva, but its underground facilities span both in Switzerland and neighboring France. CERN stands for Conseil European pour la Recherche Nucleaire but also is known as the European Lab for Particle Physics. It was founded in 1954 by 12 countries (now 20 are members) to determine the origin and structure of the universe. 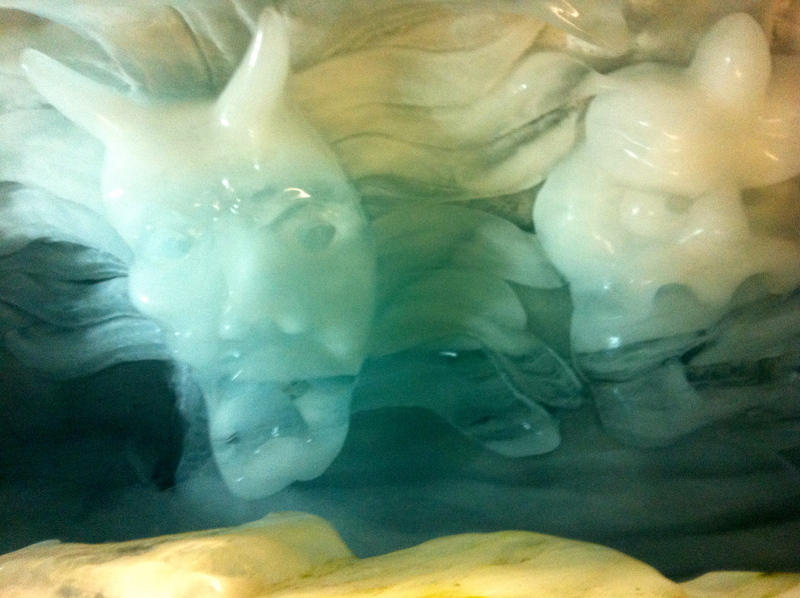 You may remember it from the scene from Angels and Demons when the antimatter was stolen. I am relieved to find out that this scene is not based on fact. You can’t use antimatter for energy like this, and it can’t be captured and “stolen”. Good to know. Especially because it under us right now. Like literally. They are trying to recreate the Big Bang underneath where our apartment lies so they can understand more about the Universe. 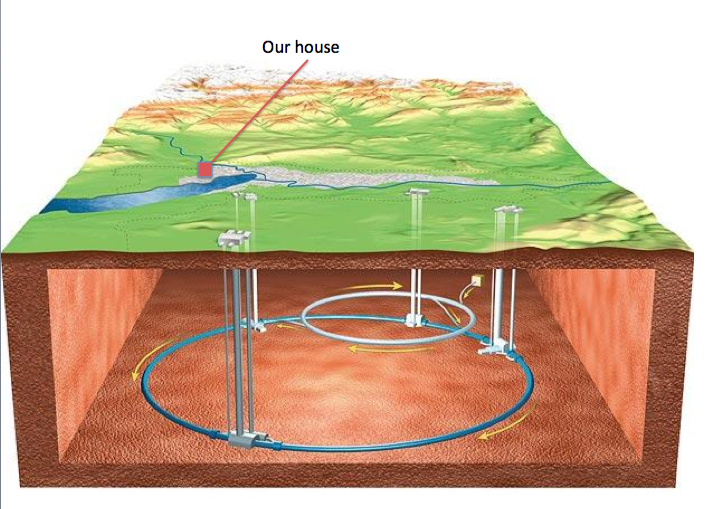 As you can see, a 27 km pipe runs 100 m underground, creating a vacuum comparable to outer space. The particles are whizzing beneath us within the ring 11,000 times a second into France and then Switzerland. Basically, they accelerate and create head-on collisions for the particles to try to detect and look for “The Higgs Particle” sometimes called “The God Particle.” Each beam has around 3000 bunches of particles, with an average of 100 billion particles in each bunch. Even with those numbers, there is typically on 20 collisions among 200 billion particles. The machine generates. However, there are so many that they can only keep the most interesting ones. So they filter for that and store only the most interesting data. They have about 100,000 computers in a networks (called computer farms) to analyze the interactions. Only 10,000 or so are here in Geneva and the rest are in labs all over the world. They use a web network to share and confirm the data transmissions. You can see in real time how this data is coming in from all over. 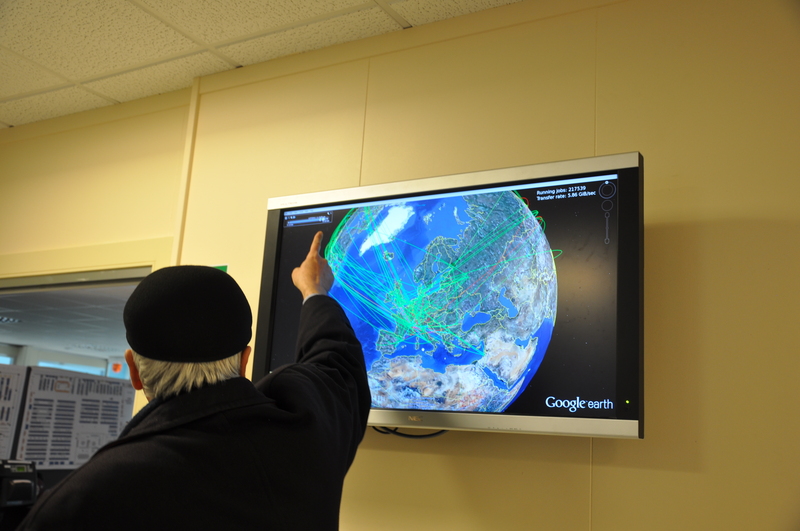 In fact, the World Wide Web was actually invented at CERN in order for scientists to share their data & experiments. Interesting! Someone is watching the data and systems 24/7. Mostly it is a team of scientists in Europe. But they said that the folks in the USA take the night shift, so its being monitored and controlled by a lab in Chicago. They used to let people underground up until when construction was finished 3 years ago. Thus, I didn’t get to go underground, but did get to see the former version that they still use in conjunction with the new systems. 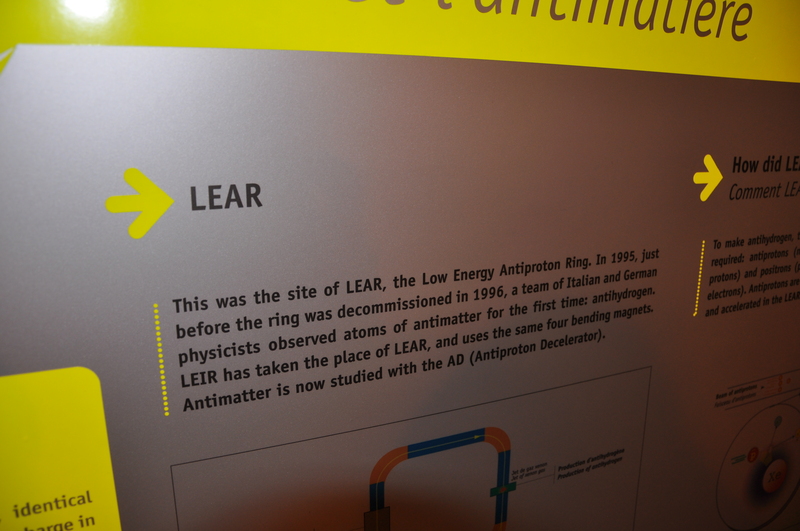 However, I did get to see the spot where antimatter was first discovered! The CERN guy joked that while the main building is in Geneva, since their facilities spans the border, they actually tap into French electricity. They are using 7 trillion volts of electricity to make this happen and in France it is a lot cheaper. Just like my groceries. For another take on the tour, check out my new friend’s blog, The Adventures of Miss Widget and Her People. Today, I am grateful for my new bionic toes. Yesterday, I had a successful operation in which the surgeon performed two procedures on both of my big toes. The procedures are a osteotomy and chilectomy. The purpose of the chilectomy was to remove the arthritis that has been causing me pain, restricting my sports activities, and literally cramping my style for the last 5 years….seriously, you should see how many cute pairs of shoes I have had to give away*. During a chilectomy, they scrape the arthritis of the joint. Also, the surgeon drills into the toe joint to clean out the arthritis inside the bone. Kind of like getting a “filling” on your tooth. Except for the fact that they let the foot heal itself by developing scar tissue. The scare tissue isn’t as good as normal cartilage but better than the pain-causing arthritis. The chilectomy isn’t guaranteed that the arthritis won’t reform in the future, so the osteotomy was done to help my odds at a preventing its re-growth. In the osteotomy, the surgeon takes out a wedge of bone in the toe joint near where the arthritis was bad. The goal is that this shifts my weight from where the arthritis damaged the cartilage to an area where there is healthier cartilage. On the right side, he ended up breaking an additional bone to supplement the osteotomy and to reconstruct the foot as my cartilage was entirely missing from the silly arthritis. He affixs his work with a screw in each foot. If you are curious, you can YouTube the procedures. However, a word of warning….Gabe did this one day and says its gross. I am grateful for being able to have the opportunity for surgery. Although its not fun that I won’t be able to walk for 3 months, not everyone has the insurance and healthcare available where they live to address issues like this. While I have long given up the idea of running again, I am just glad that this surgery will eventually make me pain free in day-to-day activity. * If you don’t believe me, please look at the type of shoes I had to wear on my wedding day. Birkenstocks!!! 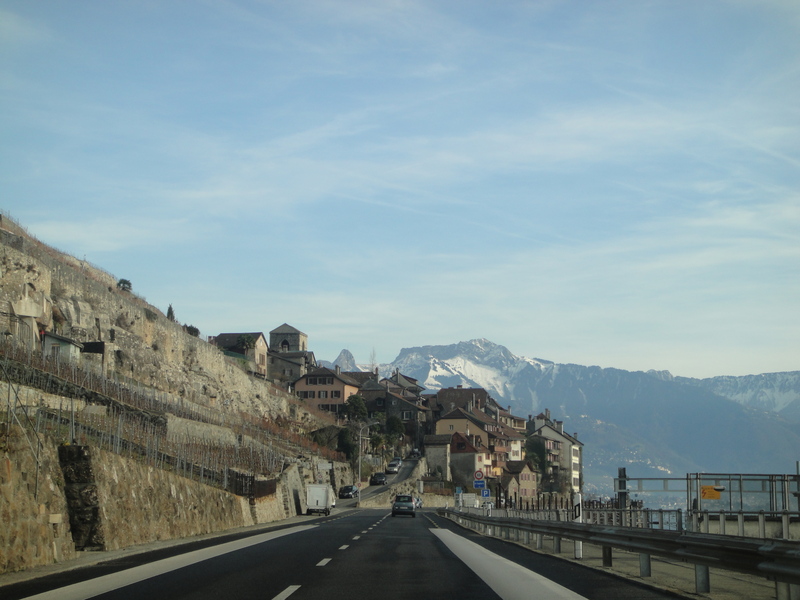 The Lavaux wine region is definitely a place you should see in your lifetime. On our first trip to Switzerland we took a day trip to Montreux, and I remember driving through this area with my mouth wide open in awe. When The Captain and Swiss Miss were here, they had wanted to hike in Lavaux; however, the Geneva record low temperatures prevented us from doing so. 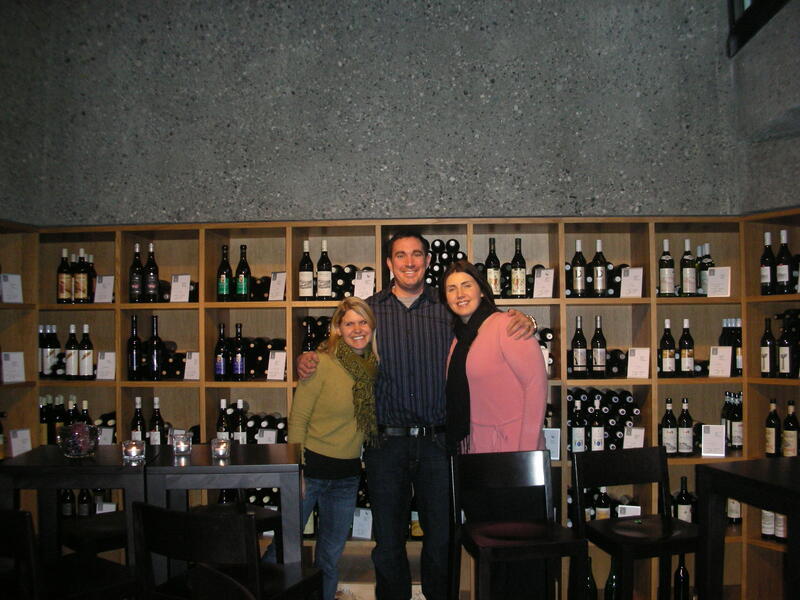 Nonetheless, we still took the train from Geneva to Rivaz to check out the wine cellar, Vinorama. Vinorama is cut into the side of the Lavaux countryside. It offers “dégustations” (tastings in French) of different Lavaux varieties. It also has a wine store offering hundreds of Lavaux bottles . During our visit, they showed us a short film about the region’s wine production. It was incredibly well done, depicting the ups and downs of a local farmer throughout the year. This helped to bring personality to this special region and to understand how hard it is to farm the land. The primary reason Lavaux is special are its terraces. They are steep, staggered, and require a lot of maneuvering on the part of the wine workers. I have seen similar ones in Cinque Terre in Italy, but no where else in the world have I seen anything like it. It takes incredibly hard work to farm that land – both in the upkeep on a slanted slope and transportation of the grapes in the harvest. And they have been doing it since the 11th Century. The film explained that it is the terrace that affects the taste of the wine. The heat from its walls warms the earth underneath the vines. This as well as the sun’s reflection off of Lake Geneva bodes well for the grapes. My favorite was hands down the Lettres des Noblesse. However at 40 CHF per bottle, it didn’t make it into our cellar on that particular day. A few days after our trip, my French tutor and I were discussing the Lavaux region. She is French and advised that of course, any agriculture product in Switzerland is very expensive. I totally agree with that statement. The terraced type of farming and harder labor can’t lend to an economical product. However, with the magic that can be found here in Lavaux, I’d also say that their wine is certainly worth it. *For hiking: we got off the train at St. Saphorin and walked to the Lutry station. It was four hours and we had magnificent views every step of the way. This of course could be shortened or you could do the wine stop as we did. All Aboard the Glacier Express! 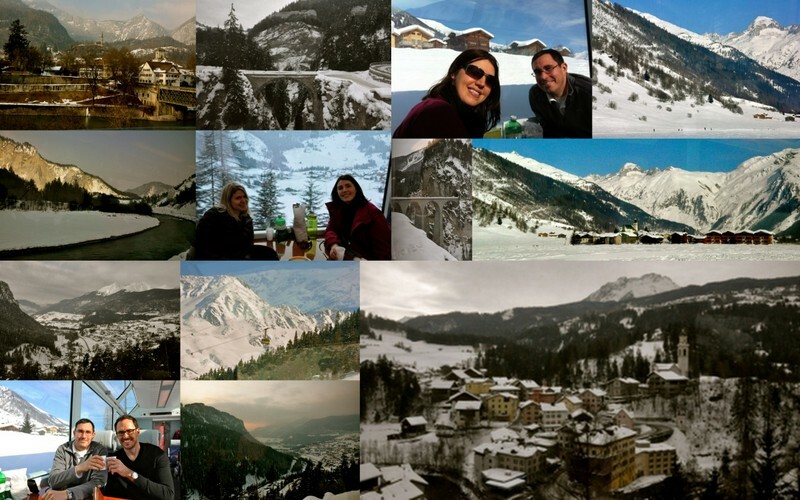 When The Captain and Swiss Miss were visiting, we took the Glacier Express. No, this isn’t the train to Santa’s house….it goes to St. Moritz. Which is sort of like the North Pole, if you think about it, full of wonder, make-believe and furry suits. The Glacier express is a very nice excursion to do if you are visiting a short time, since it covers a large part of the country of Switzerland. It travels the path in red, below. 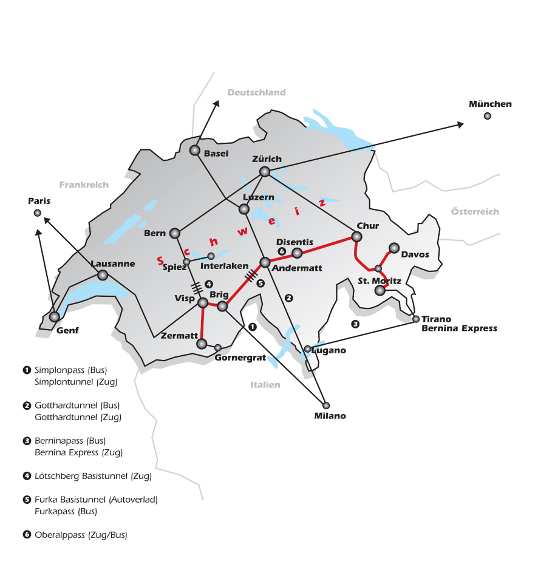 In its entirety, The Glacier express travels through 91 tunnels and 291 bridges. At altitudes of up to 6500 feet, it cuts through breathtaking mountain passes, glaciers, and by rushing mountain streams. From its windows you can experience a part of nature that has remained untouched. In fact, there is a certain part of the railway that has a UNESCO designation as a World Heritage Site, the Rhaetian Railway from Thusis towards Bergun. This was given due to its role in developing access to remote areas in the Swiss Alps as well as how the civil engineering blends seamlessly with the nature surrounding it. The Glacier Express started in 1930, a remarkable feat considering the economic crisis that was happening during that time. It experienced a slow down as well in WW2 as it didn’t run between 1943 and 1946, during the war. Up until 1982, it could only run during the summer months because the Oberalpass became impassable in winter with snow. In the 1980s, they made improvements in tunnels, allowing it to operate. 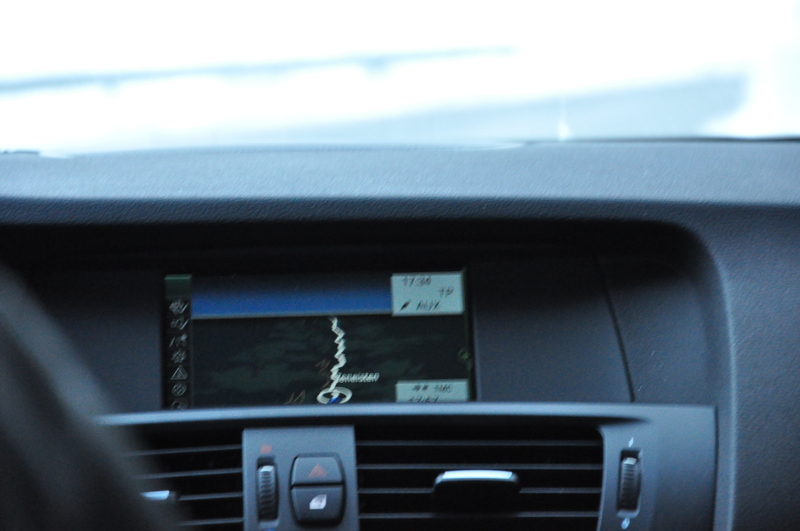 Since that time, they have upgraded the cars to be equipped with panoramic windows* for tourist’s photo taking and comfort. While the Glacier Express isn’t really an express at all (average speed is 20 km/hour), I appreciated the extra time it took to get to our destination due to the beauty of the landscape it traversed. We would recommend this to those visiting Switzerland. We also hope to check out some of the other scenic trains such as the Golden Pass, or Bernina Express during our time here. –If you are interested in taking a scenic train, Rick Steves has some great descriptions about the differences on his site. 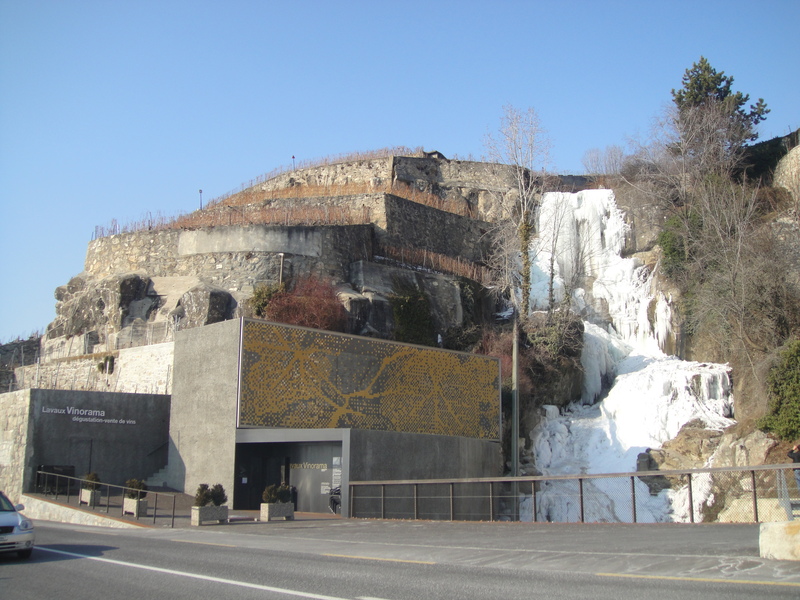 –If you are visiting, you can take the scenic trains on a Swiss pass or Swiss Flexi pass. Same goes for residents with a day card. For the Glacier express, you must get a reservation for 13 CHF in the winter or 33 CHF in the summer for a seat. 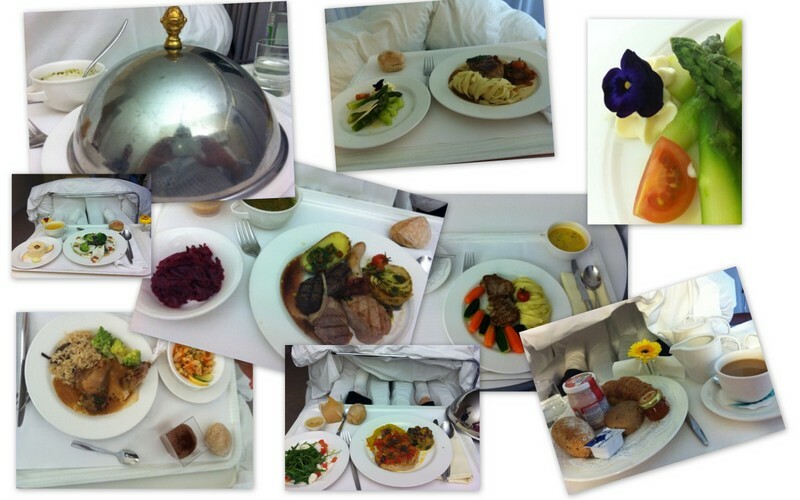 –They serve great meals on the Glacier Express; however picnics are also allowed. We brought an assortment as well as two bottles of wine. *The large windows created a magnificent view. We were blessed with a lot of sunshine on our journey which was great for us, but made our photos a little worse because of the glare. Sorry.